Put an end to your worries and keep warm this winter and for many winters to come with one of our FC500 Fire Chief Wood and Coal Burning Furnaces. 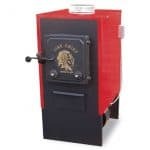 Designed for maximum efficiency with our unique 360° Cast Iron Roller Grates (with a lifetime warranty) and a Secondary Combustion Chamber – constructed of heavy gauge steel (7 ga & 10 ga) plus cast iron front and rear baffles for strength and durability – each wood furnace is pre-wired for ease of installation. Use as a central indoor, add-on or supplemental heat source. Construction – High Grade, heavy (7 & 10) gauge steel is continuously welded for maximum structural strength. 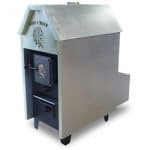 Secondary Combustion Chamber – This Inside add on wood furnace Increases fuel efficiency while re-burning smoke and wood gases before they are vented up the chimney. 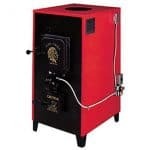 Cold Air Return/Filter Box – Standard equipment on the FC500 Indoor Fire Chief wood Furnace. The box filters the return air as well as allowing a connection for a cold air return duct if necessary. Cast Iron Baffle – Directs the combustion air flow above and below the cast iron grates creating the maximum fire temperature for every pound of fuel. Comes with a lifetime warranty. Cast Iron Roller Grates – Designed to roll 360 degrees from either direction, allowing fine ash to drop into ash pit and leaving hot coals in fire box. Comes with a lifetime warranty. Thermostatically Controlled Draft – Adds convenience with a full range of comfort determined by the temperature setting of your Fire Chief wall thermostat. 3-Speed Blower – This motor allows for gentle circulation of air when heating requirements are low and maximum output when needed. Pre-Wired Electrical System – Fully automatic components are pre-wired for your convenience and will reduce electrical installation time and expense. *The BTU ranges and heating capacity specifications are provided as guidelines only and in no way guarantee the output or capacity of the unit. The actual BTU output depends on the type of fuel being burned and its condition, the draft adjustment and the chimney that the unit is hooked up to. The actual area that the unit will heat depends on factors such as the conditions of the building, heat loss, type of construction, amount of insulation, type of air movement and location of the unit. Please Note: There may be other models available at the store that are not shown online.